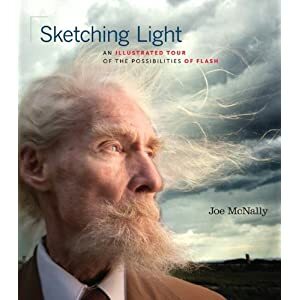 Sketching Light: An Illustrated Tour of the Possibilities of Flash is the third of photographer Joe McNally’s books that I’ve reviewed, and I never really grow tired of reading his stories. The quality of his storytelling and the depth of knowledge he has gained from years in the field is what makes his books so interesting, and Sketching Light is no different. I was also inspired by some of Sketching Light that did not really pertain to lighting. Joe works with a lot of models and subjects and he writes quite a bit about working with people. There’s also a section, “How Do You Get Fired from LIFE?”, that I was particularly interested in because I grew up reading LIFE magazine in the 1990s and surely saw Joe’s work without knowing it. He doesn’t even mention lighting in this section; instead, the section is about the actual value of accolades and how temporary the perfect gig can be. There’s a couple criticisms I want to make about Sketching Light. Joe has published three highly-regarded books now, and I think the content is starting to sound the same. The previous book, The Hot Shoe Diaries, is also about lighting and I’m not sure another book about lighting was the best idea. The content is appealing but it also seems too similar to the other two books. I’ve also noticed that Joe’s writing style is very conversational, which I usually enjoy, but it makes for longer books. Sketching Light is over 400 pages long, and I think some editing could pare that down to 350 or even 325. Some of the verbiage in Sketching Light is not necessary. I criticized Eib Eibelhaeuser for an unusually dry writing style in The Art of Photographic Lighting, but I’d say Joe McNally’s writing style could be more streamlined and direct without losing its impact. Despite this, Sketching Light is a wonderful book and any pro photographer would do well to have it on his or her shelf. I’m putting my copy next to Joe’s other two books, which I refer to regularly. Adobe Photoshop Lightroom 4 has been available a few months but only in the last week Adobe has included Lightroom in Adobe Creative Cloud subscriptions, which is potentially even bigger news than the new version 4. Photographers who have purchased Creative Cloud subscriptions now get Lightroom whenever and wherever they want it, and that makes Lightroom even more relevant than before. I’ve been working with Lightroom 4 since it was released and Adobe has made some smart improvements to the application that embrace new digital technology. I believe the most vital improvements in Lightroom 4 happen in the new adjustment brush features. Lightroom became much more useful when the adjustment brush was added a couple years ago, but Lightroom 4 lets photographers make spot adjustments to counter moiré, reduce noise or adjust white balance. The white balance adjustment is very useful and I was surprised no one thought to spot-adjust white balance before. I was so surprised I actually launched Lightroom 3 to confirm it! Basically, the Temp and Tint sliders in the Develop module can now be adjusted within a single adjustment brush point on the photo or as a general adjustment across the photo. My color correction techniques have always emphasized correction across entire images—color casts and white balance mistakes will almost always affect everything the camera sees. However, there are a few times when multiple light sources can skew results in a part of an image. There are also many photographers today who want to be more creative with their images than just getting the color correct. These photographers will really enjoy the new controls available in Lightroom 4. I am also really excited that Lightroom 4 now supports video formats. Prosumer cameras have been shooting video for a few years now and it’s becoming mainstream—some photographers like Vincent Laforet are experimenting with the art form while wedding and event photographers are supplementing their income shooting video as well as their usual photos. Adobe worked to make Lightroom 4 provide a complete video workflow. I don’t think Lightroom 4 provides a complete workflow—it’s missing basic features like sound editing, though Creative Cloud users will have all the software they need for video editing. But Lightroom 4 does provide easy importing and exporting to Facebook and Flickr as well as to your hard drive. I think exporting to YouTube is essential though. One of the most visually spectacular new features in Lightroom 4 is the Map module, powered by Google Maps, that lets photographers place their photos in specific locations. It’s a thrill to navigate the world in Lightroom 4 and see exactly where your photographic journeys have taken you, but I have a feeling Adobe will have to constantly play catch-up with advances in GPS and mapping technology. 3D mapping is starting to emerge and I think tagging photos by building floor as well as GPS location would be useful. I also thought the process of matching photos up with their locations was tedious (except when the photo already had location metadata). If there’s no location data, you can drag-and-drop photos onto the map to set their location. This is probably as good of a manual system as you can get, but it’s still a slog. Lightroom 4 boasts improved shadow and highlight recovery, and you’ll have to learn some new sliders in the Develop module to master this. In Lightroom 3, the Basic sliders in the Develop module included exposure, recovery, fill light and blacks along with brightness and contrast. (Brightness and contrast have been together in Adobe’s settings lineup since the early days of Photoshop.) In Lightroom 4, exposure and contrast are together and the other four sliders are highlights, shadows, whites and blacks. It’s confusing to consider whites and highlights two separate things (same with shadows and blacks) and there aren’t many differences between the two that I can see. Generally, the Highlights and Shadows sliders will affect darks or lights without ruining the other and will avoid excessive contrast. I still prefer working with the Tone Curve settings to pinpoint the tone regions I want to work on, though I like how fast and easy I can produce results with the Highlights and Shadows sliders. If you don’t have time to work with the curves, try the new sliders. For photographers who make prints of their work, the new soft proofing in Lightroom 4 might be useful. A “soft proof” is an on-screen representation of the final printed product, and it’s often hard to get a precise soft proof since a screen and a sheet of paper are two totally different substrates. I’ve relied on hard proofs on paper since the beginning of my career. Lightroom 4’s soft proofs look like they might be helpful but I still don’t trust them completely—there are too many factors in printing that can skew the results. But what I do find really useful in Lightroom 4 are the new gamut warnings which will show regions that are too bright or too dark to display any detail. Lightroom 4 will provide not only printer gamut warnings but monitor gamut warnings too, which I’ve not seen before. Lightroom has always had a fairly robust set of output modules (Slideshow, Print and Web) but in version 4 there is a new Book module for creating photo books. I have seen photo books offered by several photo production websites but I usually like to design my own in InDesign. I wondered if Lightroom’s Book module would be easy to use as well as robust, and I was pleasantly surprised to learn there’s a balance between software-generated layouts (see the Auto Layout panel in the sidebar) and fine controls. The Cell panel lets you put white space around images on all sides or each side separately. I found the caption and type tools very intuitive—text was overlaid on images right where I wanted them to be and I didn’t need to handle text frame corners. Everything is done inside the Book module sidebar. I found one user interface element to be particularly annoying: the inability to add photo cells on my own. The pages’ photo layouts are determined by the Auto Layout presets; you can make your own presets but they still adhere to predetermined layouts. You cannot simply drag and drop new images onto the page either, unless a photo cell already exists. The only real way to tweak photo placement is to add padding to photo cells, but this isn’t a great way to do it. Lightroom has had integrated social sharing for awhile now, but it’s been improved in Lightroom 4 in a way I didn’t really expect. If you share to comment-capable albums (a Facebook album, for example), photos’ comments will be shown in Lightroom 4’s sidebar and you can write your own there as well. Your comments will then appear on the Facebook album entry. I thought this was a really neat way to leverage Facebook’s API and integrate social comments directly into Lightroom. I also love how you can include your Facebook albums in the Publish Services panel and push photos up to it just by dragging them onto the album name. Lightroom 4 is another quality upgrade for a quality product, and its inclusion into Adobe Creative Cloud makes it available to even more people. On the other hand, I feel Lightroom is a mature application now and some of the features are not so exciting or unique. Other mature applications, including Photoshop and Illustrator, deal with the same problem sometimes. But the improvements in spot adjustments, shadows and highlights, and photo book layout in particular make me say Lightroom 4 is an upgrade worth buying. I wrote in my recent review of Jerod Foster’s Storytellers that the best storytelling techniques seem to span across art forms and can be applied to writing, composing and design as well as photography. I think that is one reason I really love Visual Stories: Behind The Lens With Vincent Laforet—the storytelling comes through not just in the pictures but in the words and the storytelling in the book itself. I thoroughly enjoyed it. Vincent is a top-notch photographer with a diverse portfolio—he shoots landscapes, people and nature equally well (though I think his people shots are the best). He’s also shot for a variety of publications and has lived and worked in many different locales around the world, so his subject matter and light are always changing and providing opportunities. The breadth of material makes Visual Stories a great resource for photographic storytellers. Fortunately, Vincent’s luck and his ability to write stories have given Visual Stories beautiful writing to go with the photography. His stories are vivid and sometimes fairly personal, which I also like—this is a book about a photographer as much as it is a book about photographs. Visual Stories does provide some good details on lenses and camera settings, but they are not emphasized often. I don’t really have anything bad to say about Visual Stories. I enjoyed reading it and photographers of all kinds will find it fascinating. All photographers have some stories to share, but Vincent seems to have more than most and they paint a vivid picture. The book’s price is a little high but it’s worth purchasing. There are two types of photography books: the nuts-and-bolts variety with detail on apertures, lenses and lighting setups, and the artistic variety that attempts to explain the ephemeral aspects of photography like creativity, inspiration and storytelling. Storytellers by Jerod Foster is in the second category and the book contains almost 300 pages devoted to the art of photographic storytelling. There’s lots of beautiful photography in Storytellers and I found myself enjoying the pictures as well as the writing. The photographs are not just Jerod’s either but other photographers who are profiled and interviewed in the book. Note that Jerod and several other photographers in the book are based in Texas, so there is a noticeable emphasis on Texas photography in Storytellers. The test with any artistic photography book is to transcend the mundane aspects of photography and describe the creative photographic process in a way that rings true. Storytellers doesn’t always pass the test—it’s a fun read and I learned some things, but some of the processes Jerod describes in the book are typical things like shot selection, composition and the use of light. These are all important topics and certainly related to storytelling, but I felt that it danced around the heart of the art of storytelling. I studied and wrote on creativity back in my college days and I’m convinced the most illuminating writing on creativity can be applied to all creative art forms and be made to “fit” with minimal changes. Storytelling techniques apply to writing and music as well as photography. While reading Storytellers, I had a hard time applying some of its lessons to those other art forms and so the lessons appealed to photographers and not always to storytellers. Storytellers is still a very fine book and fine art photographers will certainly enjoy it. It’s well-written and contains some very nice shots. I think the book will also help photographers understand how their craft builds stories and how to hone their storytelling craft. My main complaint is the lack of focus on storytelling and overemphasis on nuts-and-bolts photography topics that are probably covered in more detail in other books.